As part of a community agreement between BC Hydro and the District of Taylor, BC Hydro committed to specific mitigation measures, including those that will provide lasting benefits to the residents of Taylor and other communities in the Peace Region. To address fog conditions within Taylor, BC Hydro, in conjunction with the Ministry of Transportation and Infrastructure undertook installation of additional street lighting to increase visibility during evening hours and fog conditions. 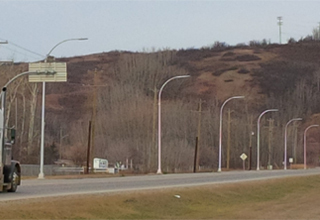 Dynamic message board signs were also installed at the summit of the South Taylor Hill for northbound traffic, and the North Taylor Hill for southbound traffic to advise motorists of local fog and road conditions. 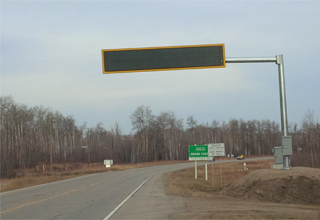 Messaging on the dynamic message boards could include notifications about surface driving conditions, road closures, construction advisories, visibility as well as being part of the provincial Amber Alert program. A web camera is also being installed in the vicinity of the Taylor bridge as part of the South Taylor Hill improvement project and will be incorporated into the ministry’s Drive BC program, providing information to the public.